Package includes replacement motor and detailed installation instructions. 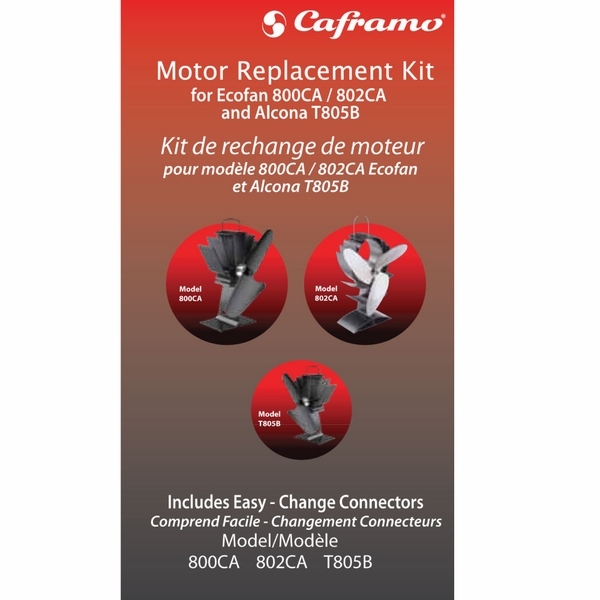 This is a convenient motor replacement kit for your Caframo Model 800 or 802 with either nickel or gold blades. Customers love the energy efficiency and warmth generated by Caframo Ecofans. If yours isn't functioning properly, this replacement motor is likely to do the trick and get your fan circulating the heat from your stove throughout your home once again. The kit includes the motor and instructions that are easy to follow. The Ecofan is a great way to increase the heat output from your gas or wood burning stove-keep yours running right with this replacement motor. Caframo 802 Motor Replacement - eFireplaceStore.com How to replace the motor on your 802 Ecofan. The process is quick and easy, and only requires a Phillips screwdriver and minor soldering. Caframo 800 Motor Replacement - eFireplaceStore.com How to replace the motor on your 800 Ecofan. The process is quick and easy, and only requires a Phillips screwdriver and minor soldering. Can you reverse the wires to obtain a clockwise rotation? Unfortunately, you can not reverse the wires to switch the rotation, as the fan blades are designed to go a specific way. I have a fairly old model 802 which is getting pretty slow compared to what it used to be. It has gold blades but a clockwise rotation. Is there a replacement motor? Yes that MRKCA02BX is the correct motor for the 802a. I have an Ecofan, but the motor is direct wired without a coupler. It is a three bladed fan, about 8" across the blades. There isn't any model number on it, but it does say made in Canada, etc. Patent #5544488. The heat exchanger is about 1 3/8" across again, direct wired to the motor and soldered to the motor. You can try to change the motor out, if it is the motor that failed and not the heat exchanger. Does the motor have a tag on it? To identify your fan and to provide any troubleshooting/replacement part numbers, I recommend contacting Caframo directly at 1-800-CAFRAMO. Will this work for a Caframo Airplus Ecofan? This will indeed work for the Caframo Airplus. We received our order in 2 days and the directions were so easy to follow . I didn't wait for my husband to get home to do it .I had the new motor on the fan and back on the stove in 15 min. ProsMuch less expensive than buying a new fan. ConsThe shipping cost almost as much as the motor. My old fan motor was clicking, and last year I removed it, oiled it, and put it back in. There was a lot of front to back motion in the shaft, and I assumed the thrust bearings were wearing out after 20 years. I put the replacement motor in in about 20 minutes, and it worked perfectly. The clicking is gone. The only thing I would like to see added to the kit is the other half of the electrical connectors, so older model fans could have them installed. I had to cut the push connectors off and splice the wires together. Not a big deal. It only took a few minutes to replace the motor and get the fan up and running again. Instructions were complete and very easy to follow. This is the second time in several years that I have purchased this replacement motor, it is very easy to replace. The ease of the directions makes it a pleasant experience. The product came with easy to read directions and was a snap to install! Totally satisfied - quick delivery, correct product. Easy replacement (with a bit of soldering). Now my fan works like a champ again! The motor on our fan was probably undetectably losing effectiveness. It was not until it suddenly started turning only about 50 rpm maximum that we really noticed it. We purchased a motor replacement from eFireplaceStore and replaced it at a fraction of the cost of a new fan and now we have instead of a gentle breeze a gale force wind (hyperbole!). Cons A little difficult separating the electrical terminal. Shipping a bit pricey. The motor replacement arrived quickly and was easy to install. Very good quality and easy to do. It was super easy to replace my bad motor on my Caframo wood stove fan with this replacement kit. The tech at the eFireplaceStore was very helpful in helping me diagnose my problem. Quickly responded same day after contracting the manufacture. Works like a charm, better than ever before. Extremely easy to replace the motor. Best instructions I have seen. Fast service, easy installation. Just needed a drop of lubercation. Very simple, very easy. unplug old and plug in new. I am glad this item is available . I use the fan thru the coldest days of the winter season. There was a vendor in Canada that would repair the fan when necessary, however they no longer provide this service. The cost is reasonable and the repair is straight-forward. My old Caframo fan stopped working and after trying to diagnose the problem the motor was all that was left that could be the cause. I bought a new bigger Caframo fan and this motor for the old non operating fan. This motor fixed the old one so I now have two fans spinning silently on the woodstove. This was a simple repair: the Allen wrench was provided and the project was very easy: unplug one motor, plug in the new one! 3 minutes and under $20.00 later we have a brand new fan! cheap solution to old fan. Our old one died and found out it was going to take several hundred dollars to replace it. For under 20 bucks my husband installed the new motor and we are up and running! Ordered this motor, received it in two days and i have the eco fan working again. Shipping price seem high for a one pound package but i got it quickly and it is still an inexpensive fix for the fan. The replacement motor kit for our little fan came very fast. They shipped very quickly. And it works beautifully!! Changed the motor and works just like it was a brand new fan! very simple to install, restored my fan to like new performance. highly recommended . First motor with the original purchase lasted 4 years, first replacement motor lasted 1 year on the second replacement motor now and seems to be working fine. ProsI like the fact that the motor speed is a function of the wood stove's heat generation and that it does not rely on an external power source. Would like to know if the base was left on the stove and the motor and fan blade were mounted on the wall if it would still work. The new motor was an easy installation and solved the clicking problem at higher fan speeds. I have a soapstone stove and hotter fires caused the noise. The motor came with a hex key for easy removal of the old unit. Instructions called for soldering but I do not have a solder tool. Instead crimped solderless terminal connectors successfully. ProsEasy replacement using solderless connectors. Included necessary hex tool..
ConsInstructions clear but did not mention solderless connections. It was what I need to fix my fan. After six long winters, the Ecofan motor died. The online electric motor part was found, shipped, replaced ... and the Ecofan lives again! Thanks ! I was concerned about having to replace this part myself, but the price of the motor made me feel that I had to give it a try before just throwing away an otherwise perfectly good tool. The directions were pictures, yet I was able to easily follow the illustrations to replace the motor. The fan seems to work better than it did when it was new. ProsEasy to install. Took just minuets. Conspicture instructions leave you looking twice before doing the installation. Easy to replace and works great...... Cheaper than buying the whole unit again! This item gave new life to my dead Ecofan at price much below my cost to replace the fan. Once installed it worked perfectly (like new). ProsLow price and did not take much time to install. ConsMy Ecofan was an older model 802 and needed the connections to be soldered to the back of the motor. For me not a problem. The kit had everything I needed to replace the existing faulty motor. 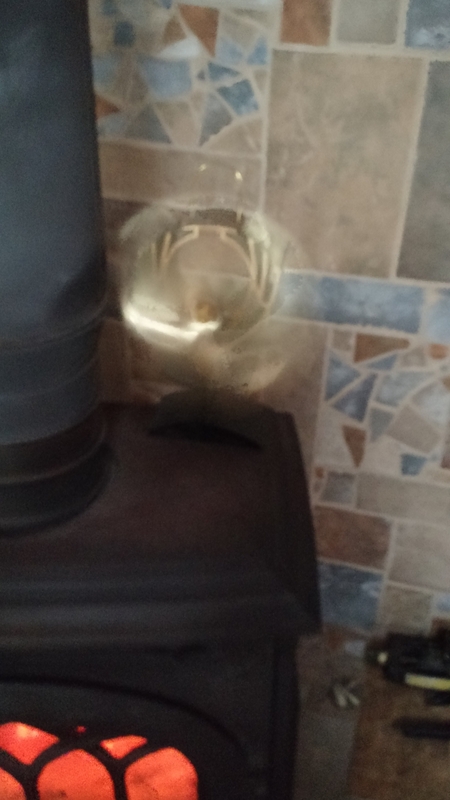 This was an easy and inexpensive fix for a relatively expensive but aging fan for my wood stove. I sent a picture of the fan and this store's customer service identified the correct replacement motor. It's like new. ProsFast service and easy to take out to old motor and put in the new one. ConsThe toughest part was soldering the wires to the new motor, but that is really very easy. Newer fan models have a plug and don't require soldering. I called Caframo customer service and told them of the problem and their rep sent me to this website. Ordered the motor. It came a few days later. Installation was simple with great instructions. Eco Fan has been spinning now non stop since the middle of December. ProsThe pictoral instructions are very good. After many years my ecofan was making an annoying noise - but now it is as good as new! Great instructions, soldering iron required, but done in 10 minutes. Ecofan is Eco indeed! 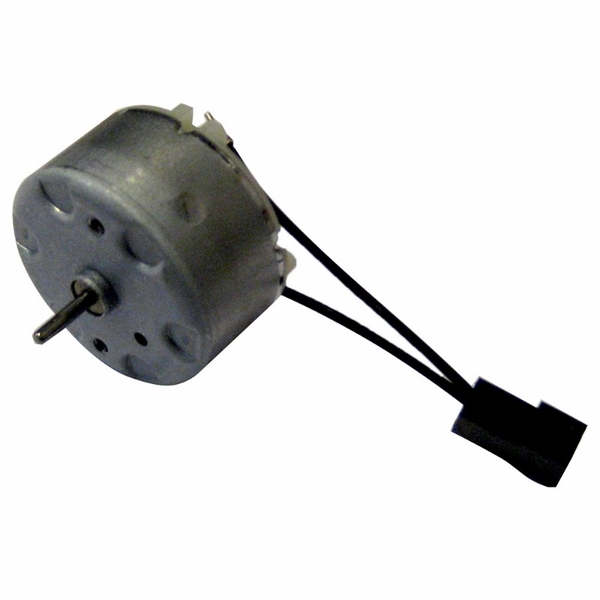 ProsYou can refurb your ecofan motor at home and ensure that it works for another 15 years! This little motor allowed my to quickly fix my broken Ecofan. I did have to teach myself to dome some electronic soldering to do it, after several small minor failures I was successful. (I knew I bought that soldering iron for something years ago). The instructional videos made it pretty simple to replace the fan except for the soldering of course. This little part saved me from buying another unit! I have had my 800 unit for years and it stopped working the end of last year. I ordered this little part, it came quickly, and I only had to ask my husband once about a question I had installing it. I'm not all that mechanical but it went pretty much like a breeze. The little motor is made well in Canada. Now the heat is just "flying" around my house once again. I'm a warm and happy woman. ProsJust a little time to install to have the fan operational again. ConsFor a little part it is a tad more than I wished to pay being on a limited budget. But I went ahead any way because the heat is better distributed with it. It came with everything to replace the old one. It was easy. The fan arrived within a few days. It works quite well and is quiet and unobtrusive. It is also a handy reference as a quick reference to see if the fire has cooled off and needs tending. My ECOfan is working again. It was easy to put the new motor on the Ecofan , and now it works even better than before. The person who took my phone order was courteous and friendly. Your website & response time is very nice, the prices are very affordable.